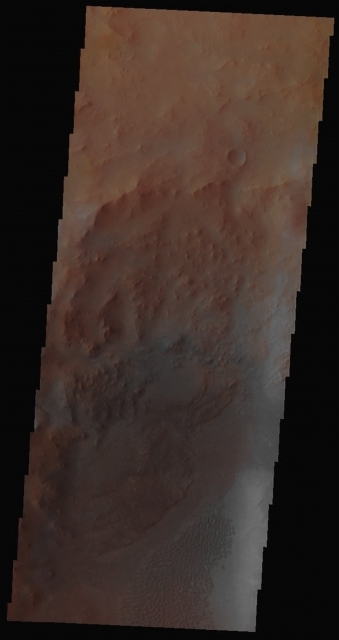 In this interesting VIS image, taken by the NASA - Mars Odyssey Orbiter on July, 31st, 2002, and during its 2.721st orbit around the Red Planet, we can see a very small section (located to the North/West) of the Floor and Outer Rim of the extremely ancient and highly degraded (even though the lack of Impact Craters in the area seems to prove just the opposite) Hargraves Crater (approx. 68 Km - such as about 42,228 miles - in diameter). A large and relatively dak Dunefield can also be easily seen on the lower right (Dx) corner of the picture. Hargraves Crater was so named after Dr Robert B. Hargraves (who was born in South Africa on August 11, 1928, and died on March 21, 2003 in the United States of America). He received his Ph.D. from the Dept. of Geology at the Princeton University in the AD 1959 and served on its Faculty for over 33 years. He was the first to propose that the Vredefort Complex in South Africa was, actually, the final result of an ancient Meteorite Impact; he discovered and studied many other Terrestrial Impact Structures and, using special magnets located onboard the NASA - Viking Landers, he finally came to discover (by giving proof of the discovery) that the Martian Dust is highly magnetic. This image (which is an Original Mars Odyssey Orbiter false colors and Map-Projected frame published on the NASA - Planetary Photojournal with the ID n. PIA 19015) has been additionally processed, magnified to aid the visibility of the details, contrast enhanced and sharpened, Gamma corrected and then re-colorized in Absolute Natural Colors (such as the colors that a normal human eye would actually perceive if someone were onboard the NASA - Mars Odyssey Orbiter and then looked down, towards the Surface of Mars), by using an original technique created - and, in time, dramatically improved - by the Lunar Explorer Italia Team.